Ordinary soaps just give a feeling of cleaning your face, but after some time your face starts looking dark and oily again. 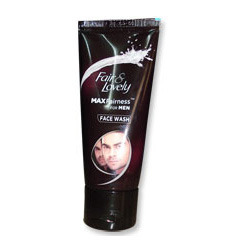 The new Fair & Lovely Max Fairness Face wash for Men not only deep cleans oil and dirt from your face but also gives you longer lasting fairness due to its unique fairness vitamins. 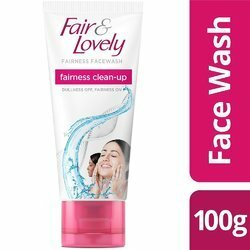 Parlour like instant glow, everyday Fair & Lovely fairness face wash now comes with the new VitaGlow formula that goes deep within the layers of your skin to deep clean your face and give you an instant glow, in just 1 wash.
WHAT USERS ARE SAYING I use this face wash twice a day. It cleans my face from the dust and pollution and makes my skin look fair. Fairness like Laser Light Treatment For best fairness results, skin experts around the world use Laser Treatment. Now experience Fairness like Laser Light Treatment with Fair & Lovely's best formula. Hidden Pollution Off, Fairness On Expert pollution clean-up face wash, its charcoal action formula targets and pulls out even hidden pollution. Gives you the fairness of a parlour clean-up.